While I can’t remember the first time I was exposed to The Mountain Goats, I would guess it around 10 years ago. I just started college and instantly was exposed to a whole new lineup of bands. This is also when The Sunset Tree was released. 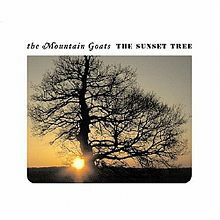 There were 8 Mountain Goats albums before The Sunset Tree, most notably 2002’s Tallahassee and All Hail West Texas. The Sunset Tree exposed a very personal side of John Darnielle. He pours his heart out about painful childhood memories like abuse, drinking, and loneliness. In the end, there is an eventual release. He pats the listener on his or her back and provides comfort. When I heard “This Year,” something clicked. It was a powerful exclamation of survival. For each painful breakup (friendship or romantic), there was a session of playing “This Year” on repeat, screaming out “I am going to make it through this year if it kills me.” It served as an anthem for the pain and suffering that comes with being wrecked by uncertainty and a lack of hindsight. Tough moments are masked over happy melodies. For many people, the music we listen is directly correlated to our mood. That is where “Dance Music” comes in. “Dance Music” is a prime example of finding common ground. Beneath the happy-go-lucky tempo, there is a darkness lurking within the lyrics. It is almost like a mask. Going through life is difficult and this song provides the listener with the ability to drown out the sadness with a dose of musical joy. More than anything else, music provides us with a connection to those around us. An off-hand comment to a stranger about a obscure song can lead to a friendship. The more I think about it, the more I know that is true. Those shared lyrical journeys are like shared memories, leading us towards the promise land of lifelong friendships. “Dance Music” is like a knowing glance from a well-meaning stranger or friend. Just turn up the volume knob and all will be okay. The Sunset Tree touches upon a variety of themes. One of the most pronounced is that of friendship. Friends help us get through the hard times. There is a certain element of community with the aura of Darnielle and his stories. While the band often employs other members, like drummer Jon Wurster, it is clear that Darnielle is the head of a hyper-literal support group for thoughtful music fans. For a certain type of person, music and friendship go hand-in-hand. It is easy to use music as a catalyst for connecting with fellow humans and building life-long (or momentary) networks. On The Sunset Tree, Darnielle shares his own personal story and reaches out with a supportive hug. He is open and raw and the music reflects that.